Slightly edited version of an article originally published under the title "Russian Imperialism Meets Illusions of Ottoman Grandeur." 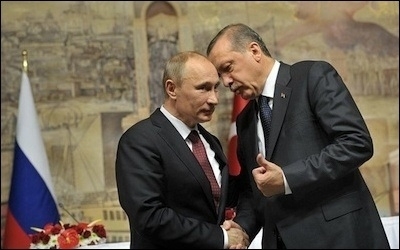 Turkish President Recep Tayyip Erdogan (right) says he doesn't understand why Russian President Vladimir Putin (left) intervened in Syria, since Russia "does not even border Syria." Turkey's failure to devise a credible policy on Syria has made the country's leaders nervous. Both Davutoglu and President Recep Tayyip Erdogan have lately resorted to more aggressive, but less convincing, rhetoric on Syria. The new rhetoric features many aspects of a Sunni Islamist thinking blended with delusions of Ottoman grandeur. Erdogan's rhetoric on Syria blends Sunni Islamist thinking with delusions of Ottoman grandeur. A legitimate question to ask the Turkish prime minister might be: What is the basis of "moderate" Islamists' presence in Syria? For Davutoglu, only countries with regional ambitions convergent with Turkey's have the right to tamper in former Ottoman lands.